Digital image courtesy of the Metropolitan Museum of Art collection, The Collection Online. The Ancient Near East was a region that could easily have been considered as the cradle of civilization. This was the place of the earliest forms of civilization, which could be seen in places such as Mesopotamia and Sumeria. The goddess Inanna/Ishtar was the foremost deity of Uruk, a city-state of Sumeria, and therefore critical to the Ancient Near East’s culture. Key elements that made this region drastically different than previous civilizations could be the clear utilization of agriculturally-viable environments, and possibly most important, this region was the first to be urbanized. Inanna, the patron deity of the city of Uruk in Sumeria, encompassed the agrarian and environmental aspects of this urbanized society, which can be ascertained from this ceramic head of a ram within this exhibition. The Sumerian goddess Inanna/Ishtar was the patron deity of Uruk and the goddess who held sway over warfare and politics. Uruk was divided into two regions: one region was dedicated to the deity Anu, and the second region was dedicated to Inanna. Her name was written with a sign that represents a reed stalk tied in a loop at the top, which appears in even the very early texts from the mid-fourth millennium BCE (Inanna Mark Paragraph 1). In the article pertaining to Inanna by Joshua J. Mark, he referenced historian Gwendolyn Leick and her analyses of Mesopotamian culture. She said that from royal inscriptions of the early Dynastic Period, Inanna was frequently cited as a protectress of sorts for the kings, with Sargon of Akkad attributing his success in battles and politics to her (Inanna Mark Paragraph 2). While the deity was known as Inanna initially, as time went by and civilizations fell and rose, she became identified with the Akkadian goddess Ishtar, a Semitic deity associated with fertility. This is in part due to the Akkadian poet Enheduanna, Sargon of Akkad’s daughter, linking the two, and therein bringing Inanna from a local vegetative deity to the Queen of Heaven and ultimately the most popular goddess in Mesopotamia (Inanna Mark Paragraph 1). In this later form, she was a figure of political and military power, but also sexuality, eventually culminating in her surpassing Anu in popularity within Mesopotamia. To further understand Inanna in Mesopotamian culture, one must look to mythological history and written texts of the time. Some particular sources that Mark addresses are Inanna and the Huluppu-Tree, which was an early creation myth, Inanna and the God of Wisdom, in which she brings knowledge and culture to Uruk, The Courtship of Inanna and Dumuzi, a tale of Inanna’s marriage to a vegetation god, and a poem entitled The Descent of Inanna in which the Queen of Heaven journeys to the underworld (Inanna Mark Paragraph 3). Within this vast mythological record of Uruk, Inanna was often said to have stolen the sacred meh from her father-god Enki at the sacred city of Eridu and brought them with her to Uruk. The meh were described as “divine decrees which are the basis of the culture pattern of Sumerian civilization.” Eridu was considered by the Sumerians to be the first city created by gods and therefore a place holy to them. By Inanna removing these decrees, she signified a transference of power from one city to another. In the aforementioned Inanna and the God of Wisdom, Enki makes an attempt to retrieve the decrees and return them to Eridu; however this is all in vain. Inanna successfully tricked her father and made Uruk, not Eridu, the seat of power in Sumeria. The moral to this story, particularly in relation to how Sumerians viewed the goddess Inanna, would be that Eridu was associated with rural life, whereas Uruk was the embodiment of the new way of life which was the city. This story would have given ancient Mesopotamians a reason as to why Eridu declined in importance as Uruk rose in size: it was the work of the gods (Uruk Mark Paragraph 5). Metropolitan Museum of Art. Copyright and Proprietary Rights. The text, images, trademarks, data, audio files, video files and clips, software, documentation or other information contained in these files, and other content on the Websites (collectively, the “Materials”) are proprietary to the Museum or its licensors. The Museum retains all rights, including copyright, in the Materials. Copyright and other proprietary rights may be held by individuals or entities other than, or in addition to, the Museum. 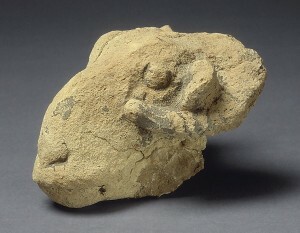 Keeping all of that information regarding Inanna in mind, this specific image depicts the head of a ram, made from clay. It may not immediately be clear how this artifact would pertain to Inanna, as she was said to ultimately be the goddess of war, politics, and later, sexuality; however, prior to her association with the Akkadian deity Ishtar, Inanna was a local vegetative god, with far less power than she had later. On the Metropolitan Museum’s website containing this image, it further explains this line of thinking, saying, “Indeed, it seems that images of sheep were common in the city at this time, especially within buildings associated with the cult of Inanna, goddess of Uruk. This might indicate that animal sculptures, such as this example, played a role in religious practice” (Metmuseum.org). Therefore, in this state, Inanna would have been represented in art as an animal, to encompass the importance of agriculture and the environment. It also would have represented Inanna’s ability to better society through the citizen’s continual devotion to her. Mark, Joshua J. “Inanna,” Ancient History Encyclopedia. Last modified October 15, 2010. http://www.ancient.eu/Inanna/. Mark, Joshua J. “Uruk,” Ancient History Encyclopedia. Last modified April 28, 2011. http://www.ancient.eu/uruk/. “Head of a Ram.” The Metropolitan Museum of Art. Accessed March 10, 2015. http://www.metmuseum.org/collection/the-collection-online/search/326655?rpp=30&pg=1&ft=inanna&pos=1.